Waiting for JJ at the Dollop Café. Lila, his girlfriend, and Carl, his best friend, are catching up. 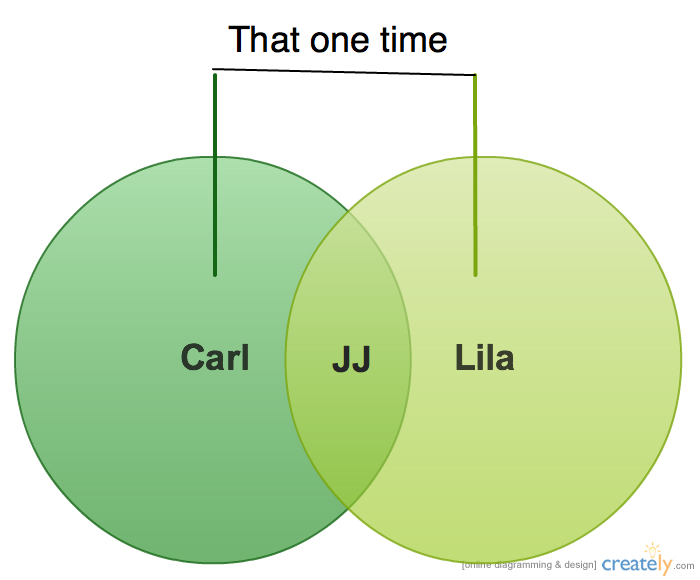 JJ is the only shared area in their friendship Venn. Meaning they only hang out when Lila and JJ are together. Except for that one time, of course. The waitress brought them that good Dollop Café dark roast and they fixed their coffee in silence. JJ was coming toward them, moving through the tables, a man feeling good, in the flow. He reached the table and smiled down upon them. “That’s for sure,” said Lila.